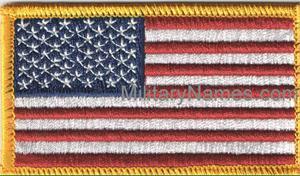 EMBROIDERED FLAGS Military Name Tapes & Rank Insignia. Leather Flight Badges for all Branches of Service. USA State Flags available sew on or with velcro for the uniform shoulder. Embroidered 1 3/4 x 3 1/2 inch Full Color British Flags.